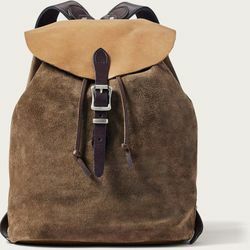 Filson Small Rugged Suede Backpack. Filson's Small Rugged Suede Backpack is an heirloom-quality piece crafted in the Seattle factory using the finest American leathers. The body is made of boot-grade Rugged Suede leather from Chicago's Horween Tannery that's specially tanned to provide lasting water protection. Its reduced size is ideal for smaller frames and lighter loads. Fully lined with cotton and outfitted with a cinch-top closure and storm flap.